Nabrman, or “white flower”, is the brainchild of two Emirati women, who showcased their Spring/Summer collection of abayas on Day 3 of Dubai Fashion Week. The classic loose-fitting and flowing abayas retained their shape and form, whilst being embellished with subtle prints and satin sashes. Three of the outfits incorporated light digital printing of green and blue bands in varying intensities on their sleeve ends as well as along the edges of the skirts. The 16 piece collection inserted hints of glamour while preserving their essence of minimalism. The abayas presented were modest but equally high on the elegance quotient, representing the personality of the UAE-based brand. The models were accessorized with minimal jewellery and black shoes so as not to distract the focus from the abayas on display. 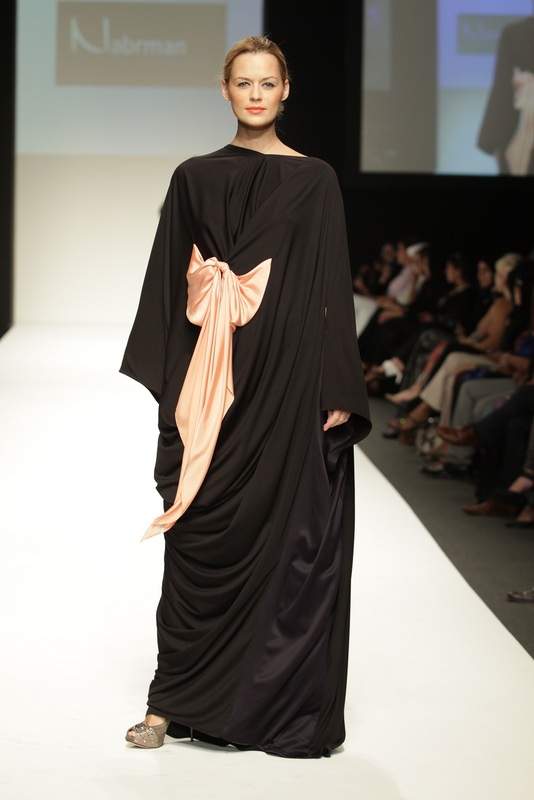 Daywear abayas were accompanied by satin sashes in baby pink, violet, brown and ivory. The sashes were draped over the abayas in innovative ways, resulting in a variety of silhouettes that transformed the traditional abaya into works of art. The eveningwear abayas factored in more glamour as they were complemented by brightly coloured satin gowns that were overlaid with the sheer black fabric, touched up with a shimmering finish. The collection was clearly aimed at the modern Emirati woman who wishes to keep up with the latest trends, while holding steadfast to her of values of modesty and simplicity.